You not be aware that Delve is now rolling out to office 365 early adopters and then to every one. Now that you know what it is you want it for your Office 365 tenant right? So how can you get on the earlier adopters, known as First Release program? Easy. Login into your Office 365 web portal as an administrator. 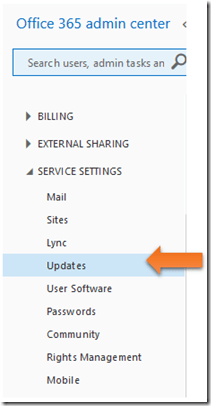 In the Office 365 admin center expand the Service Settings option. Then select the Updates option. Now on the right ensure that the First Release option is set to on. Sooner rather than later you’ll get all the latest stuff for Office 365 including Delve which I’ll be covering in future posts so stay tuned.